Virgin Media has suffered hacking attacks targeting its website following its compliance with a court order to block the illegal file sharing website The Pirate Bay [TPB]. However The Pirate Bay condemned that DDoS attacks saying they constituted a form of censorship in themselves. The ISP was the first to block access to the website and others are expected to follow suit with Sky, Everything Everywhere, TalkTalk and O2 all ordered to prevent their users being able to visit TPB by Friday 11th May. Twitter feeds associated with the Anonymous collective announced, "Virgin Media - Tango Down #OpTPB". While Virgin Media was forced to take its website down, there was no lasting damage and the site was up after little more than an hour [BBC]. The DDoS attacks are an indication that users of the file sharing website will not take the injunctions and web-blocks lying down. Within hours of Virgin Media's block on The Pirate Bay alternative links were being disseminated through Twitter and other social networks. However, there are signs the situation is also being exploited by individuals wanting to make money. "Unauthorised copies" of The Pirate Bay were drawing in some users exposing them to potential charges. Several of the copycats are said to have inserted requests for payments into the unlicensed material indexed by The Pirate Bay. The Pirate Bay are enraged, and have launched a vitriolic attack on those emulating their website. "Charging money for free downloads is against the whole philosophy of the internets [sic]. We do not condone anything like that. This site [ThePirateBay.ee] is a bad copy of other sites, like TPB, and it's totally meaningless. Go for another site," the Swedish Pirates said in a statement. 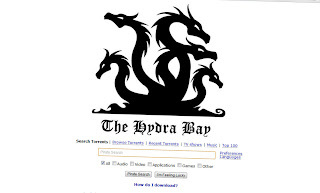 In its war with the ISPs and the copycats The Pirate Bay has renamed itself The Hydra Bay complete with a new logo and a list of more than 40 proxy addresses. The new name is in reference to an ancient nameless serpent-like beast with reptilian traits that possessed many heads, referred to in Greek mythology [Lernaean Hydra]. According to legend the severing of one head resulted in two more growing back, though one head was said to be immortal. The court order makes provision for ISPs to add other proxies to the list, though to date only the main domain has been blocked. For its part Virgin Media insists that it is only blocking access to The Pirate Bay because it was forced to do so. Users of Virgin Media trying to access The Pirate Bay are redirected to another page and a statement from the ISP which reads, "Sorry, the web page you have requested is not available through Virgin Media. Virgin Media has received an order from the Courts requiring us to prevent access to this site in order to help protect against copyright infringement." In a reaction to the court order, Virgin Media said there needed to be "compelling legal alternatives" in order to change consumer behaviour. Copyright defenders, including the British recorded music industry body BPI, have argued that illegal copies of films, books and music made available on file-sharing sites destroy creative industry jobs and discourage investment in new talent. The perceived losses have prompted companies and organisations representing copyright holders to lobby governments to introduce stronger legislation and methods to stop file sharing. While those downloading music, movies and computer programs for free are reducing profits of the record companies, film makers and the like, many file sharers argue that banning free file-sharing would not translate into extra sales for the copyright owners. For those who have a disposable income, spending a few dollars, pounds or euros on a legitimate DVD, CD or computer program is simply easier than searching, downloading, unzipping and saving files on the Internet. Those that download such material are more likely to be unemployed, have smaller incomes and less money to spend on the legal product. A person working 8 hours a day and arriving home at 6pm is more likely to buy a DVD from the local supermarket, make a purchase from an online store or simply flick on the television after a hard day at the office. Such arguments do not wash with corporate business however. Anti piracy groups are chasing file sharers and looking to judges to impose harsh penalties. In one case due to be heard in the Czech republic later this month an individual who allegedly uploaded thousands of movies and TV shows to file sharing services will face trial and a possible 5 year prison sentence. The 29-year-old committed the alleged infringements over a period of more than 4 years and is accused by the movie industry of costing them nearly $4.2m. But the charges have been labelled as ridiculous by those who defend the right to share files on the Internet. "The way they estimated the damages is simply ridiculous," said Mikulas Ferjencik, vice-president of the Czech Pirate Party. "The Czech Pirate Party believes that it should be up to the copyright monopoly owners to prove that they were actually damaged by downloads. We think that the current setup, where copyright monopoly owners receive the 'average market price' multiplied by three, is unconstitutional." The growing restrictions and perceived censorship has prompted an interest in VPNs, or virtual private networks, in order to circumvent such blocks. Use of such software has mostly been seen by those in countries like China and Iran where governments seek to block access to sites considered subversive. Proposals to monitor Internet activity which will be announced in the Queen's Speech today [Wednesday 9th May 2012] will raise the stakes further. Privacy advocates, as well as file sharers, will be looking closely at how such measures will affect online activity. The director of Big Brother Watch, Nick Pickles, said web blocking was "a crude tool" and would not stop "determined users". Jim Killock, executive director of the Open Rights Group, said the moves seen recently were "pointless and dangerous" and would turn "criminals into heroes". Concerning the attacks on Virgin Media, The Pirate Bay condemned the hacks. "DDoS and blocks are both forms of censorship," The Pirate Bay said in a statement posted to its Facebook page. "We'd like to be clear about our view on this: We do NOT encourage these actions. We believe in the open and free internets [sic], where anyone can express their views. Even if we strongly disagree with them and even if they hate us. So don't fight them using their ugly methods."